Do you remember the tale about Rumpelstiltskin? You know that strange little man who spins straw into gold for a fair young maiden to save her father? Stiltz! The Musical takes this tale and turns it into a 21st Century story using technology in the plot instead of a spinning wheel but it still is about gold or rather greed and love. Deborah Johnson, the composer and lyricist, and Paula Miller, author of the book and additional lyrics, chose this well known tale to create a light, song and dance story still using the devotion of a daughter for her hapless father and of course the “falling in love” story with star crossed heartthrobs. It opened and is currently playing at the Actors Forum Theatre in the NoHo theatre district in Los Angeles, California. There are few new musical scores that small professional and community theater groups can afford to produce. These artists have created a number of such musical scripts and they continue to produce more. This is their latest creation. Johnson and Miller took this story that most of us were told as children and added the nuances of our current daily life. With songs like “Voice Mail,” and “Techno Man,” the audience knows right away that the story has been moved to modern times. The authors are to be commended for being innovative and taking a classic and surrounding it with the terms and challenges of today’s world. Stiltz! The Musical is in the expert hands of directors, Wayland Pickard and Doug Engalla. Previously Mr. Pickard partnered with Ms. Johnson in creating the popular eLove, the musical now published by Samuel French Publishers. At this time, they are also touring together in Legendary Duets. The duo also directed Polyester The Musical in 2009. The hapless daughter, Lacey, is played by a lovely actress, Alli Miller. She brings a freshness and charm to her role. Ms. Lacey is surrounded by a supportive cast, which includes Daved Wilkins, Gwendolyn Druyor, Suzan Solomon, Ross Kramer, Larry Lederman and Robert Moon as the Stiltz. Although some of the cast members have strong singing voices others were performing with limitations. The strongest performances were by the two female leads, Alli Miller and Gwendolyn Druyor who demonstrate their ability to create a believable relationship as friends. The male cast members struggled with both their acting and singing. This show is perfect for small theaters, as it can be performed with minimum sets and production values and the cast performs the score with pre-recorded arrangements rather than live musicians. The use of the mobile backdrops in the musical numbers was ingenious. Both the directors and the production team made good use of the small stage. This is the first production and with the experienced team of Johnson, Pickard and Engalla herding this performance, one can only imagine that it will improve as they discover what works and what does not work quite as well. Although it was the intent of Johnson and Miller to provide each performer with a song, they might want to reconsider that tact and limit the production to those songs, which really drive the story. For a fun evening in the theater , go see Stiltz! 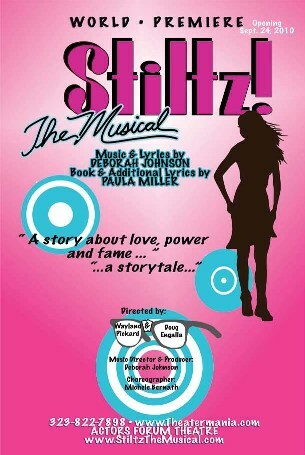 The Musical at Actors Forum Theatre located at 10655 Magnolia Blvd., North Hollywood, CA. 91601 To buy tickets online go to www.theatermania.com and for more information go to www.StiltzTheMusical.com. The show will be playing through October 17, 2010.